Thinking about what kind of kayak you want to buy? Here’s everything you need to know to choose the right kayak for you! What do you want to do with your kayak? Do you want to paddle slowly across a lake or down a lazy river, rush swiftly downstream on Class 5 rapids? Skirt lightly across the seafoam while checking out a pod of dolphins? Or maybe you like to hunt or fish? Or take the family camping? 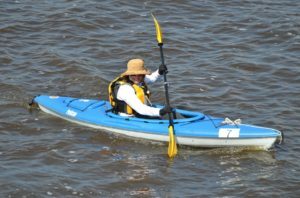 There is a kayak that is right for you and this article will help you figure it out. Click an item in the table below to quickly move around this article, or scroll to continue reading. Recreational kayaks are best for use on flat water such as bays, lakes and slow-moving rivers. They vary in length, but are usually longer. They have smooth hulls with a wide beam (width at the widest point, measured at the waterline). They are not built for speed as much as stability and good tracking (ability to move straight ahead). These are great kayaks for beginners as well as being particularly useful for hunters, fishermen and photographers. They can be purchased in a variety of materials and styles and may have features specific to a particular sport use. 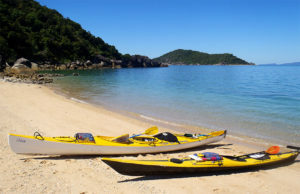 Touring kayaks are built for comfort and stability for use over an extended period of time on flat water such as lakes, bays and slow-moving rivers. They are long in body and moderately wide of beam and have good tracking. The cockpit is often generously-sized and the stern bulkhead is usually enclosed, while the bow bulkhead is open. Sometimes these will have rudders or outriggers. Whitewater kayaks are designed for speed and maneuverability. Users sit low in the cockpit with legs tucked inside, producing a low center of gravity, increasing the stability of the craft. The lip of the cockpit opening allows a skirt to be installed to keep water out of the boat, but these kayaks must still be bailed occasionally. Because the user can often remain mostly dry, this kayak has an extended seasonal use. These kayaks are short, usually 10 feet or less, and rely on the user to control tracking with the body and paddles. They have enclosed bulkheads, sometimes with a small waterproof chamber for important items. Sea kayaks are designed for open ocean paddling. They sit low on the water for greater stability in sea winds. They are especially long, usually 15 feet or more and have sealed bulkheads. They often have rudders to help compensate for currents and wind, and accessory attachments such as compass and deck pump. Some might even have outriggers and sails. Surf Kayaks are used in much the same way as a traditional surf board, to catch fast moving ocean waves. They have designs that are uniquely different from most other kayaks. They are usually short and have flat bottoms and sharp edges to make tight turns. They have sharp, upturned bows (noses). These come in a variety of specific designs including those called “waveskis” and are used for competitions as well as recreation. 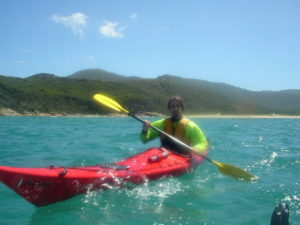 Kayaks come in a variety of body designs that suit the different uses of the kayak. Sit in kayaks have a relatively small cockpit opening and a seat set low in the body of the kayak to keep the center of gravity low and increase stability of the craft. The user’s legs go up inside the kayak. A skirt can be installed at the lip of the cockpit and cinched around the user’s torso to keep water from splashing inside. 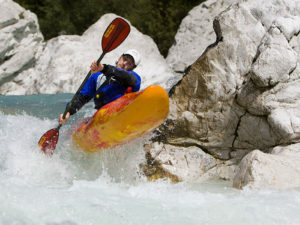 Whitewater kayaks use the sit in design. Many recreational kayaks are sit in kayaks. Sit on top (SOT) kayaks generally feature a sealed construction with the user sitting atop the kayak body. The users legs are on top of the kayak rather than inside. This kind of kayak design is used often in recreational and touring kayaks, as well as sport fishing kayaks. The design allows the user to be open to the sun, to be able to carry equipment and to be able to sit upright to fish. Some SOT kayaks have molded seat designs and some have a variety of different seat accessories attached. These kayaks are usually difficult or impossible to sink because they cannot take on enough water. They can be easily flipped to drain and re-enter. There are an increasing number of hybrid body designs with sit on top features that may also have storage wells, and partially or fully enclosed bulkheads. Some hybrid kayaks incorporate some features from both a kayak and a canoe. These often have low seats for comfort and stability and wide bases to accommodate standing postures. They may have thwarts between gunwales like a canoe that can accommodate sport accessories. Many kayaks today are made of plastic, usually high-density polyethylene (HDPE #2) which is often sourced from recycled consumer waste. These kayaks can be returned for recycling at the end of their useful lives. Plastic is generally the cheapest material, but the heaviest, sometimes weighing two or three times its fiberglass or carbon fiber counterpart. Plastic kayaks are durable and resistant to marring and structural damage from water hazards. They can be molded easily into a variety of shapes and can have molded seats, foot rests and accessory features. Proper repair of damaged plastic kayaks requires specialized plastic welding technology. Here’s a cool video on how a rotomolded kayak is made. Enjoy! Fiberglass kayaks are lighter than plastic kayaks, making them easier to handle out of the water. However, they can be two to three times as expensive as plastic. They are also more rigid and more susceptible to impact damage than plastic. Kayaks made from these high-tech materials have the benefit of being extremely light and very strong, but the price is considerably higher than other material choices. Newer on the market are inflatable kayaks made from polyvinyl chloride (PVC) and other plastic formulations. Inflatable kayaks can be lighter, more portable and less expensive than their other plastic counterparts. Inflatable kayaks, while very durable, are more susceptible to puncture than other plastic kayaks. These materials are classic for kayaks historically. They can often be purchased in do-it-yourself kits. These kayaks can be very light and portable and are excellent choices for hikers who need to carry in their boat to remote lakes or have long portages. When you choose a sit in kayak, the cockpit size will be important to consider. You will be in contact with the kayak material at your bottom, hips/thighs, knees and feet. These contact points should be comfortable and supportive to allow you to control the boat. The opening of the cockpit will vary depending on the use of the kayak. A sea kayak will have the smallest opening, to keep crashing waves from swamping the skirt. A whitewater kayak will also have a smaller opening for the same purpose, but still small enough for the user to retain their seat during a rollover. A touring kayak will have a still larger opening and a recreational kayak cockpit may be quite large and will not be sufficiently narrow to keep the user in the kayak during a rollover. Your choice of paddle is an important factor in your comfort and ease of motion. Different uses of the kayak require different shapes of paddles. The length of paddle will also vary based on the use of the paddle and also the size of the user and the personal style of the user. The length of kayak will vary both with the type and use of the kayak and also with the preference of the user. Whitewater kayaks and surfing kayaks tend to be shorter, usually less than 10 feet while touring kayaks and sea kayaks are generally longer. 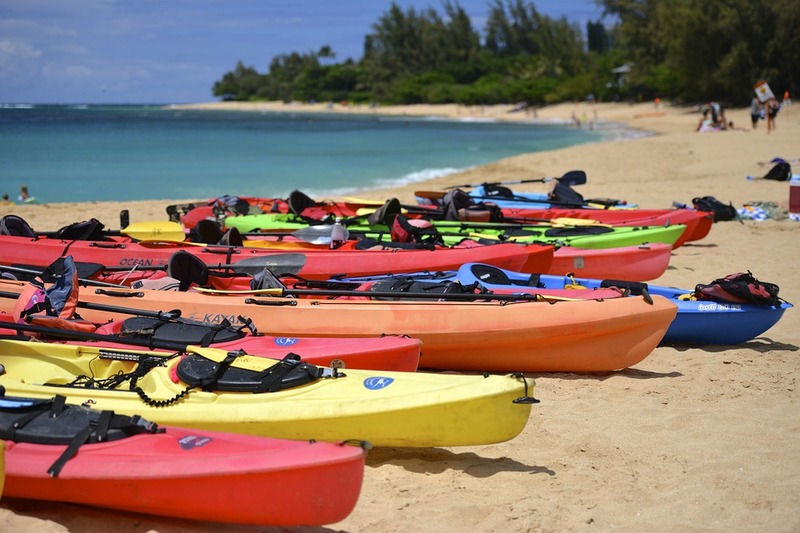 Recreational kayaks can vary significantly in length based on the intended use. Depending on what you want to do with your kayak, and whether you want to be solo or always bring a friend, you might consider whether you want a solo or a tandem kayak. Generally speaking, tandem kayaks are more difficult to operate with only one paddler, so a tandem kayak will necessitate always bringing a friend on your outings. You should always have a personal flotation device (PFD) for each paddler in a kayak. This vest should be properly sized and fitted to the person wearing it. Besides this necessary item, other accessories come in handy. You may want a cockpit skirt, to keep water out of your sit-in kayak. You will need some way to bail water so you might want a sponge or a pump. Now that you have some information about the types of kayaks that are available, you have a great start on choosing which kayak is right for you. In upcoming posts we will review kayak brands, discuss relative merits and help you find the best kayak to meet your needs and your budget. This entry was posted in Overviews on May 13, 2016 by Diver T.
Good question, Al. Ideally, one should be seated in the kayak with knees slightly bent. In a sit in kayak, the knees should also splay outward slightly to brace against the sides of the kayak. All of these positions help the user have the best control of the kayak. 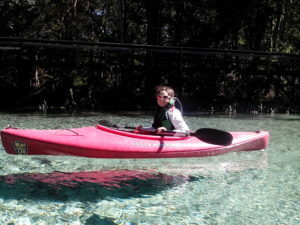 Having the rear on the bottom of the kayak or with the seat in the lowest position is also the best position for stability and proper paddling technique. That said, there can be too much and too little bend and each person must find their comfort zone. Most modern kayaks have multiple molded foot braces as these kayaks here or an adjustable foot brace system as seen here or here. These are designed to fit a range of leg lengths, but generally, the legs should not be completely straight. This is such a great, informative article for Kayakers. I didn’t realize there were so many designs to choose from. Really cool! 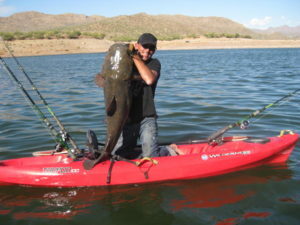 I use a Kayak mainly for fishing out on the lake (on old plastic on handed down from my uncle) and want to invest in a bigger one – been catching some big Bass and Catfish lately and want to catch some more! Which material do you think is the most suitable? I don’t mind paying more for something that will last me longer and be more durable. Hi Bailey, Thanks for the question. The most common material that is commercially available is high density polyethylene. It is easy to form into nearly any shape, generally inexpensive to produce and is recyclable at the end of the kayak’s useful life. A couple of great fishing kayaks we have reviewed are the Native Slayer and the Wilderness Systems Pungo 140. Check them out at the links! Hey, what a great article! I’m planning on introducing my 12 year old son to Kayak fishing. I was thinking of buying a tandem kayak but after reading your article about these being difficult to operate solo, can you recommend something for him that he won’t grow out of too quickly? If you are just going to be paddling around in relatively quiet waters, he would probably do well with something like the Wilderness Systems Tarpon 100 sit on top kayak. It is a small, easily to maneuver kayak that has a lot of flexible uses other than just paddling. It is great for fishing. You can see more about the Tarpon 100 here. We have the sit on top kayaks and they seem to be great, although they tend to start to take on water pretty quickly. Do you know of a solution to that?